AMES, Iowa (AP) — This used to be the time of the year when Iowa State would start to fade — if it hadn’t already. Coach Matt Campbell and the Cyclones have instead finished their second straight October unbeaten, and they’re peaking heading into the sport’s most crucial month. Texas Tech’s Alex Bowman was forced into a safety with 4:39 left, Hakeem Butler added a 48-yard TD catch from Brock Purdy just over two minutes later and Iowa State rallied to beat the Red Raiders 40-31 on Saturday. Bowman’s two-point blunder was the break the Cyclones (4-3, 3-2 Big 12) needed to clinch their third straight win behind Purdy, their star freshman, after a 1-3 start. Iowa State: At times, the Cyclones looked more like that team that started 1-3 than the one on a winning streak. But Iowa State’s defense made a number of big plays, none bigger than its third safety in as many weeks. 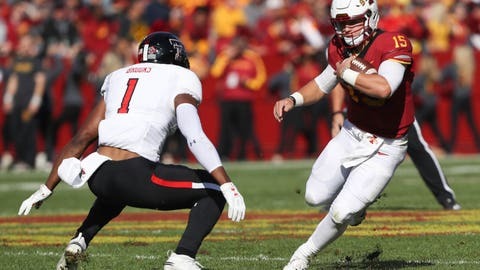 The Cyclones could be favored in four of their final five games — and the second spot in the Big 12 title game remains an unlikely but somehow realistic goal. Texas Tech: The Red Raiders blew a massive opportunity to take charge in the Big 12 standings with home games against Oklahoma and Texas. Tech wasted an early 10-0 lead, committed 10 penalties and rushed for just 30 yards. The Red Raiders have allowed a staggering 106 points in their last two trips to Ames. “We didn’t finish. We’ve been preaching on finish throughout the summer, but we came up short. It was really tough,” linebacker Riko Jeffers said. Purdy’s emergence might have come with a cost. Campbell said after the game that Zeb Noland, a sophomore whose job Purdy took in a 48-42 win at Oklahoma State, took a personal leave of absence this week. “I don’t know where that is right now. But he did nothing wrong,” Campbell said, noting that he’s hoping to have something more definitive next week. Antoine Wesley had eight catches for 119 yards, including a gorgeous 31-yard TD grab to tie the game at 24-all after Iowa State had scored 10 points in the first four minutes of the second half. …Tech opened the scoring by blocking a punt that Thomas Leggett fell on in the end zone. …Iowa State was 7 of 16 on third downs. The Red Raiders entered play ranked second in the Big 12 in third down defense. “At halftime he told us that we had to go out and play the way that we know how to play. We’re either going to be pretenders or contenders, and that’s all he had to say. We’re not pretenders, so it had to be the other one. So we had to boss our stuff up,” Spears said about Campbell’s halftime speech.